Premium tank names are yellow. 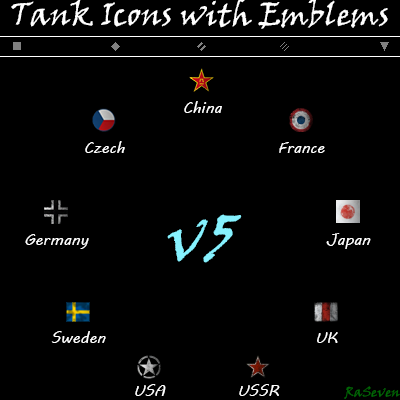 With gray class icons (diamonds, squares and triangles). in variant "B"
Choose A, B, C or D version in Options folder. Open Data folder and copy the entire gui folder to your most recent ...\World_of_Tanks\res_mods\version# folder. Download and install XVM mod. Be sure to turn off the roman numeral vehicle tiers in order to prevent clutter. Settings > General > Show vehicle tier. САУ и ПТ-САУ подкрашены соответственно в красный и синий цвета. в вариантах "A", "B" и "D"
Названия премиум танков - жёлтого цвета. Иконки класса техники (ромбики, квадраты и треугольники). в варианте "B"
Цветные иконки класса техники (ромбики, квадраты и треугольники). В ВАРИАНТЕ "C"
Выберите A, B, C или D версию в папке Options. Скачайте и установите мод XVM. Убедитесь, что выключен показ уровня танка. Настройки > Игра > Показывать уровень танка. Hmm... interesting... I remember a long time ago fix for mirrored icons was the same, then it was changed to other fix method. If this fix works, that's good finding, gj dude, thanks! :) Will add it to the new update. Thanks a lot again Raseven! I've fount this post in the EU server forum about fixing mirrored icons without XVM. It has a link to a couple of files that work. More than loyal dude! I think and try to influence people to use it. It saves screen space and the amount of distractions on it.! Thanks again to add and rename the existing icons. I am poor and from Argentina. Otherwhise i'll donate. Hi, yes, XVM now is different, and config is in "...\World_of_Tanks\res_mods\xvm\configs\sirmax.xc" Open it with text editor and change "mirroredVehicleIcons": true, to "mirroredVehicleIcons": false. Hi, my XVM does not have XVM.xvmconf And the enemy tanks are shown mirrored. Do you have any suggestions?